The growing influence of an apocalyptic Satanic death cult inside an already dangerous U.S. neo-Nazi domestic terrorist group has resulted in internal turmoil and new leadership of the clandestine armed Atomwaffen Division, some of whom are active duty soldiers in the U.S. military, a several month investigation shows. A white supremacist Iraq war veteran currently serving in the Arizona National Guard was recently appointed new national leader for the Atomwaffen Division—the third change in leadership in less than two months as other members resign in the wake of a South Carolina based apocalyptic Satanic doomsday cult consolidating their control over the American domestic terror group, according to former members of Atomwaffen Division, intercepted online discussion logs, interviews, documents, and other sources. 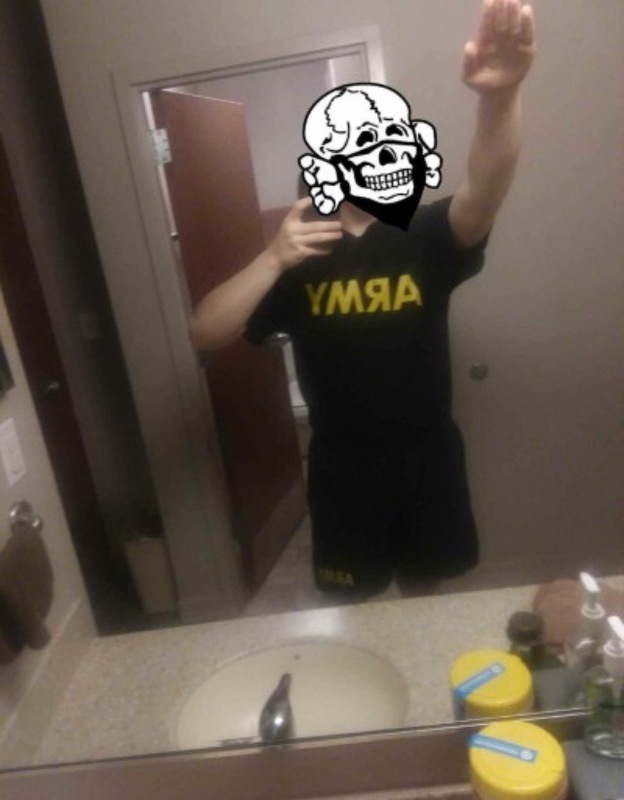 Another top leader of Atomwaffen Division is a U.S. army soldier stationed at Fort Bliss, Texas who is a practicing Satanist, ardent devotee of mass murderer and cult leader Charles Manson, and an avowed Nazi. 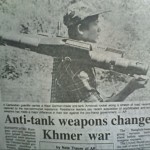 A third key leader is a convicted domestic terrorist from when he was “Minister of Islamic Liaison” for the white supremacist Aryan Nations and who leads an extreme South Carolina Satanic temple that practices human sacrifice and other rituals that make even most mainstream practicing devil worshippers recoil in objection. At least nine members of the Order of Nine Angles Tempel of Blood Satanic group are now in key positions of leadership in the white supremacist, neo-Nazi Atomwaffen Division domestic terror group, which has vowed a campaign of random violence, mass murder, and terror attacks to destroy American institutions. The Order of Nine Angles offshoot Satanic Tempel of Blood is an extremist sect of Satanism steeped in Nazism that practices real life human sacrifice, or murder, champions figures such as Hitler, Charles Manson, Pol Pot, the government and ideology of North Korea, and Jim Jones, among a long who’s who list of serial killers and terrorists. The Tempel of Blood requires it’s Satanic initiates to infiltrate extremist political movements susceptible to disruption, manipulation, and conversion in efforts to radicalize them to engage in violent acts of murder and terror. 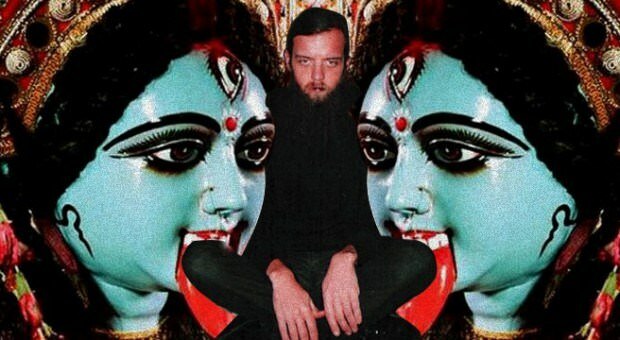 The current main ideological texts of the Atomwaffen Division are the books Liber 333, Iron Gates and Bluebird, all Satanic manuals authored by Joshua Sutter and published by Martinet Press, which is run by his wife Jillian Hoy. 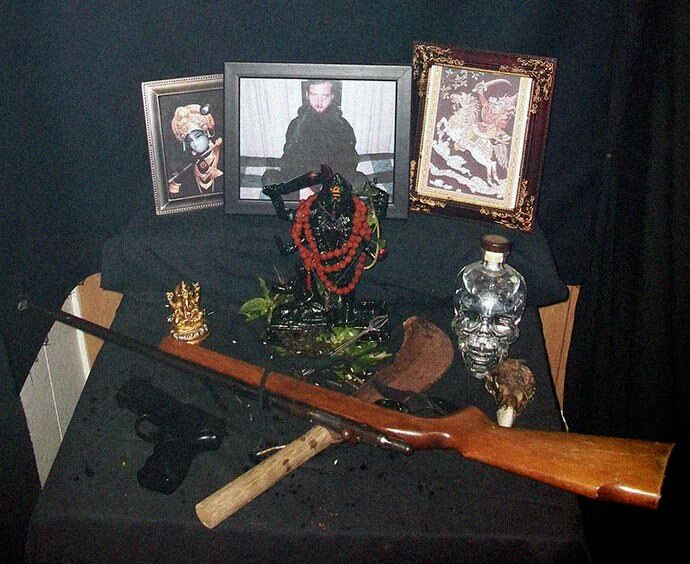 While Sutter has never used his real name in his political activities over the last decade, an investigation has confirmed that the myriad of the fringe religious and political activities and groups, including the Satanist Temple of Blood, as well as the couples publishing house and books, all operate from Joshua Sutter’s home, a single wide trailer hidden from the road in the woods in rural Lexington County, South Carolina. 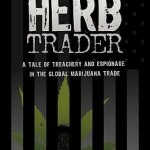 For nearly two decades, Sutter and Hoy have built Satanic networks and tasked members to infiltrate, disrupt, manipulate, and control extremist political and religious groups, particularly in the white supremacist movement, in order to influence adherents to commit acts of terror and murder to further their Satanic objective of sparking general chaos and apocalyptic destruction forcing a collapse of the institutions of society and government. These and other findings resulted from a months long investigation that has also revealed many of the real identities of key members of the clandestine Atomwaffen Division, which, until recently, has been active in at least 22 states, Canada, and Europe, and responsible for at least five murders since 2017. Planned terror attacks on U.S. soil by other members have also been thwarted, according to federal and local law enforcement officials. The Atomwaffen Division hold up Charles Manson and Adolph Hitler as their twin political visionaries, applaud and celebrate all lone wolf terrorist attacks and have vowed a campaign of random terror against non-white ethnic and religious groups and government infrastructure to spark a “helter skelter”—a race war they hope will force an apocalyptic collapse of U.S. society. 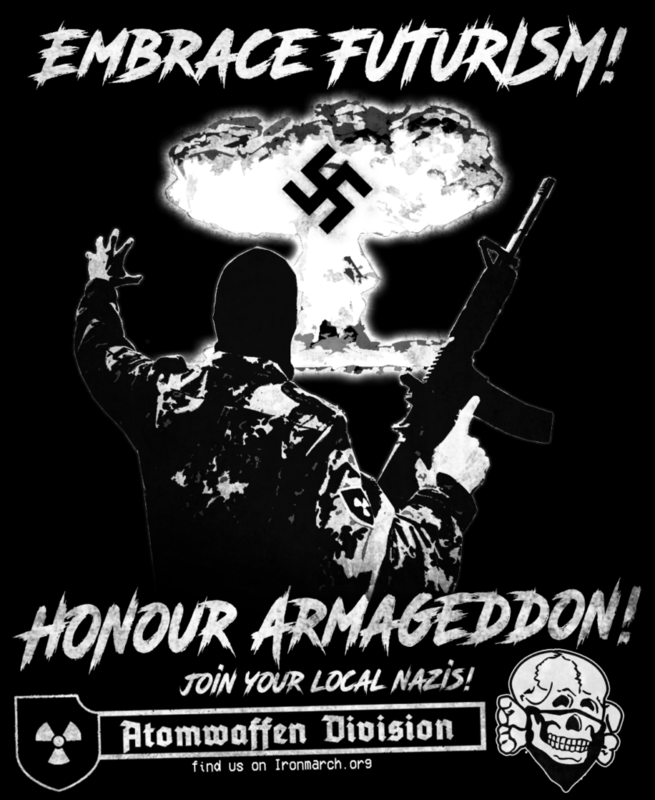 Federal law enforcement and hate group monitors consider Atomwaffen Division one of the most dangerous domestic terror group known to be currently active in America. 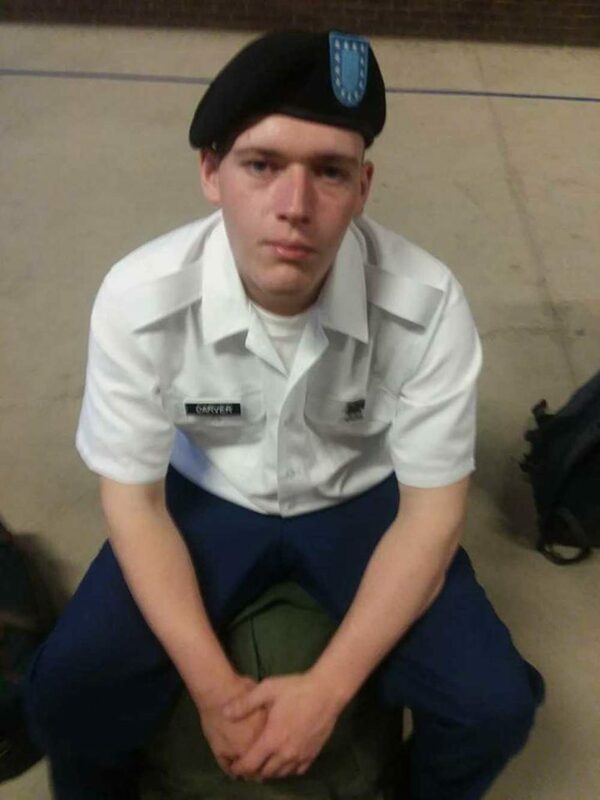 U.S. army Private First Class Corwyn Storm Carver, 22, is an ideological leader of The Atomwaffen Division and a combat medic attached to the U.S. army 1st Armored Division, 4th Battalion, 27th Field Artillery, Headquarters Battery at Fort Bliss in El Paso, Texas. 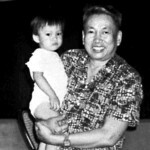 He has called for the violent overthrow of the U.S. government and the extermination of Jews, is an avowed Nazi, a devotee of mass murderer Charles Manson, and a follower of the Order of Nine Angles, an extremist Satanic sub-culture that advocates human sacrifice. Order of Nine Angles adherents advocate the use of dark religious forces, mass terror, and fascist ideology to achieve their political end game of a collapse of societal institutions. Carver, 22, of Chesapeake, Virginia joined the Atomwaffen Division in 2016, and, according to U.S. military documents, later enlisting in the U.S. army on April 11, 2017, since rising to become one of the terror groups leaders. 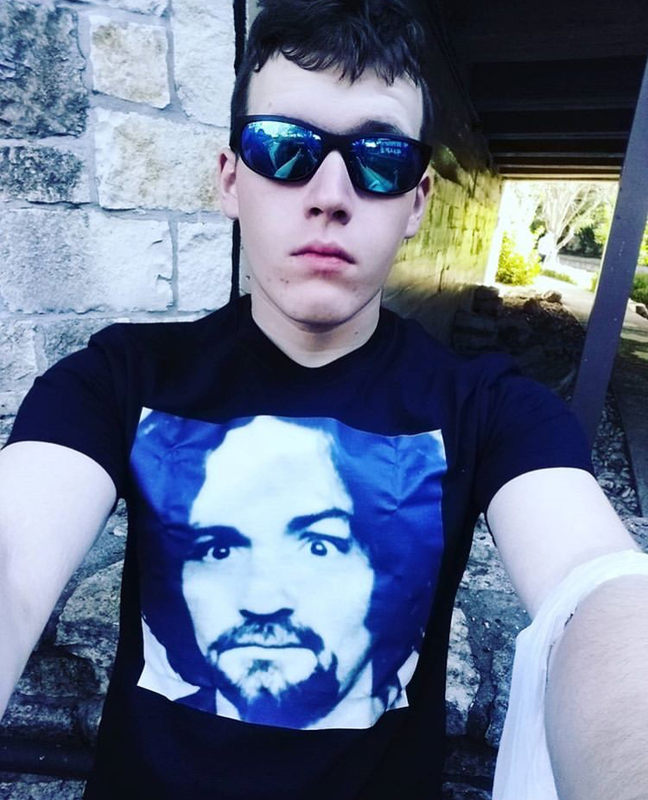 “We’re Manson’s retribution my dude,” Carver wrote on January 28, 2018 to other Atomwaffen Division members on one of the group’s secret online discussion boards where they use pseudonyms to communicate with one another. 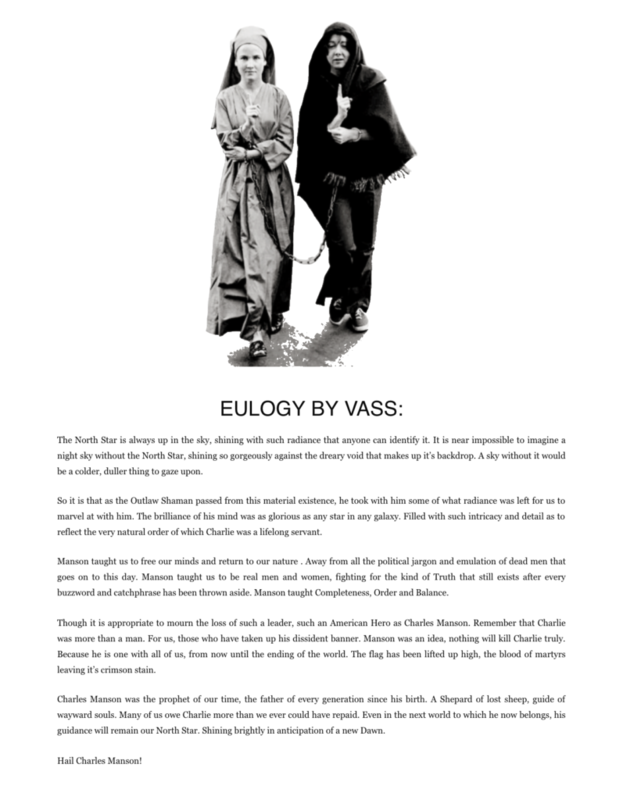 “Charlie was more than a man. 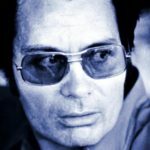 For us, those who have taken up his dissident banner, Manson was an idea Nothing will kill Charlie truly,” Carver wrote in an eulogy in December 2017 on the fascist forum Universal Order. Helter Skelter is a slogan coined by Manson to describe random violence and murder committed to spark a race war. “‘Kill em all’. Precisely the position,” he concluded. “Because of the conditions we find ourselves in, the fascist worldview has to be applied through the creation of a new nation in the United States,” Carver said in a January 2017 fascist radio podcast interview, using his Atomwaffen Division alias “Vass”. Corwyn Carver grew up in the southeastern Virginia town of Chesapeake, outside of Norfolk, and was raised from birth in an occult religious community. The only child of William and Sheila Carver, the family are enthusiastic members of the Asatru Folk Assembly. His father, William, is a science teacher in the Norfolk, Virginia public school system, and an Asatru priest, medieval reenacter, and leader in Virginia occult circles. The senior Carver uses the alias Norsewyk Grimnir in his Pagan activities, which include leading the local Eastern Beach Kindred Pagan organization and teaching classes on Northern Magic and Northern Lore in the Asatru Pagan community. Carver is part of a Virginia re-enactment group called A Time in History, which appears at public events to demonstrate ancient Nordic religious and historical practices such as sword fighting. After Asatru Folk Assembly leader McNallen publicly supported the August 2017 white nationalist Unite the Right rally in Charlottesville, Virginia that ended in deadly violence, many followers of Asatru organized a joint declaration denouncing the Asatru Folk Assembly, its doctrines and its leadership as a racist organization. Since then over a hundred Heathen organizations have signed the statement, isolating the AFA from many of their former allies, and pushing them toward increasingly public white nationalism. 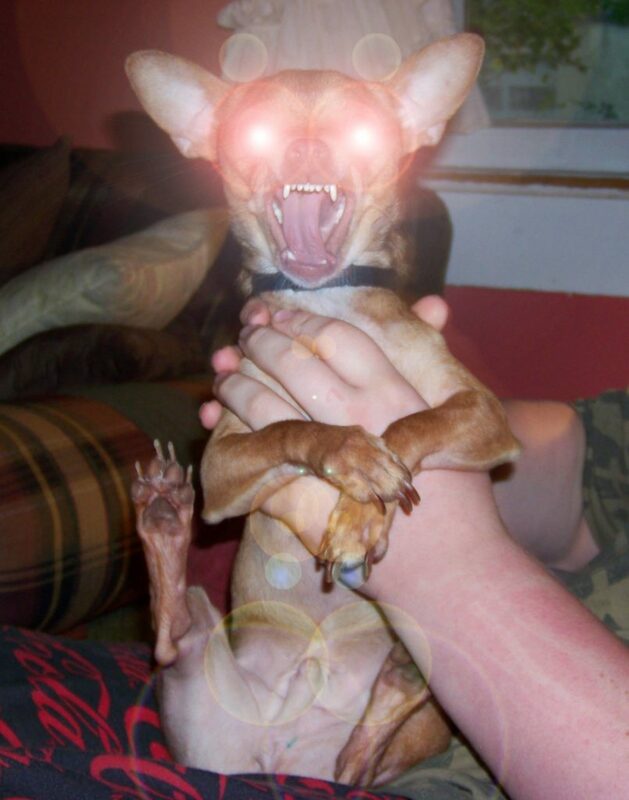 In January 2014, William Carver posted a photograph of his son, who was 17 at the time, holding a Chihuahua dog which depicted the Nordic God Fenris, a powerful wolf in Norse mythology who killed the god Odin during the events of Ragnarok, the apocalyptic battle where most were killed, and the world was struck by natural disasters and submerged in water. Afterwards, the world resurfaced from the apocalyptic collapse anew and fertile, and rebuilt from the ashes. The story parallels the objective of the Atomwaffen Division terror group, who say the current world order must be destroyed before it can rise again from the ashes to be reorganized under superior Aryan control. In Norse Pagan mythology, Tyr was a Norse war god who presided over matters of law and justice. Prophecies foretold that Fenrir was destined to cause the God’s great harm and, because of Fenrir’s great strength, they kept him chained. Only Týr had the courage to approach Fenrir and give Fenrir food and Fenrir bit off the right hand of Tyr. Fenrir was then chained to a boulder and a sword was placed in his jaws to hold them open, later to break free and run throughout the world with his lower jaw against the ground and his upper jaw in the sky, devouring everything in his path, even killing the powerful Norse warrior God, Odin, in a vivid Pagan depiction of the apocalypse. Fenris is the basis of the wolf in the modern children’s story Little Red Riding Hood. 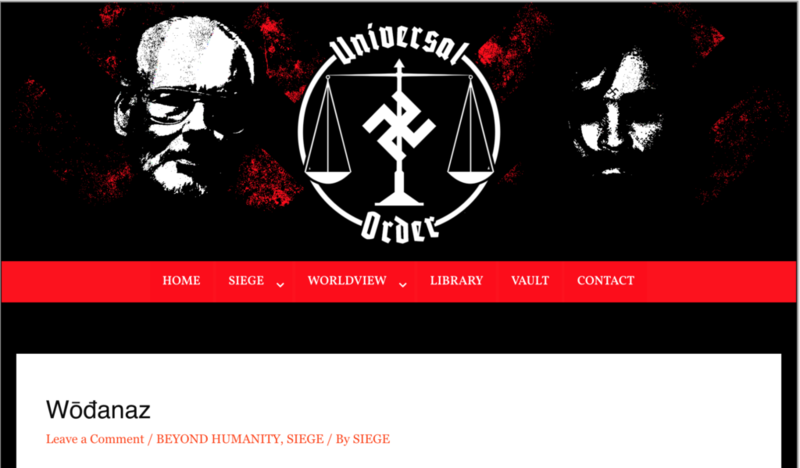 In a 2018 article by Carver on the fascist online forum, Universal Order, used by Atomwaffen Division to distribute their propaganda, Carver invoked stories from ancient Norse mythology to argue for the use of mass violence and terror to achieve their political objectives. “Wōđanaz has nothing in common with cowardly movementists who hide behind numbers and limit their action to an enternal enforcement of old social orthodoxies,” Carver wrote. The “chaotic nature of Wōđanaz gives way to deeper truth. 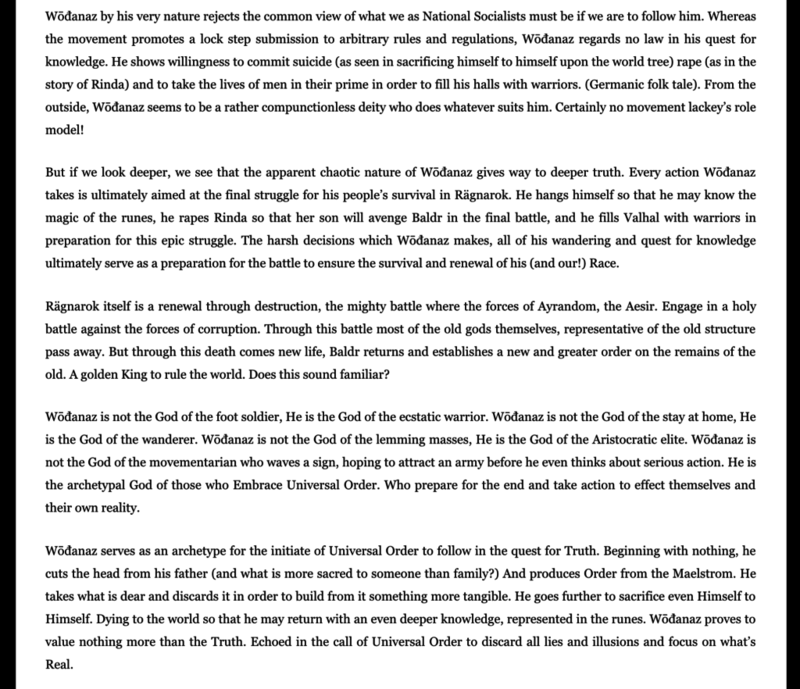 Every action Wōđanaz takes is ultimately aimed at the final struggle for his people’s survival…a renewal through destruction, the mighty battle where the forces of Ayrandom…engage in a holy battle against the forces of corruption. 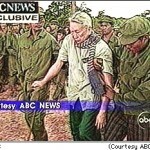 Carrying out lawless violence and carnage will result in that “representative of the old structure (to) pass away. But through this death comes new life…and establishes a new and greater order on the remains of the old. A golden King to rule the world. Does this sound familiar?” asks Carver. “Wōđanaz is not the God of the foot soldier, He is the God of the ecstatic warrior. 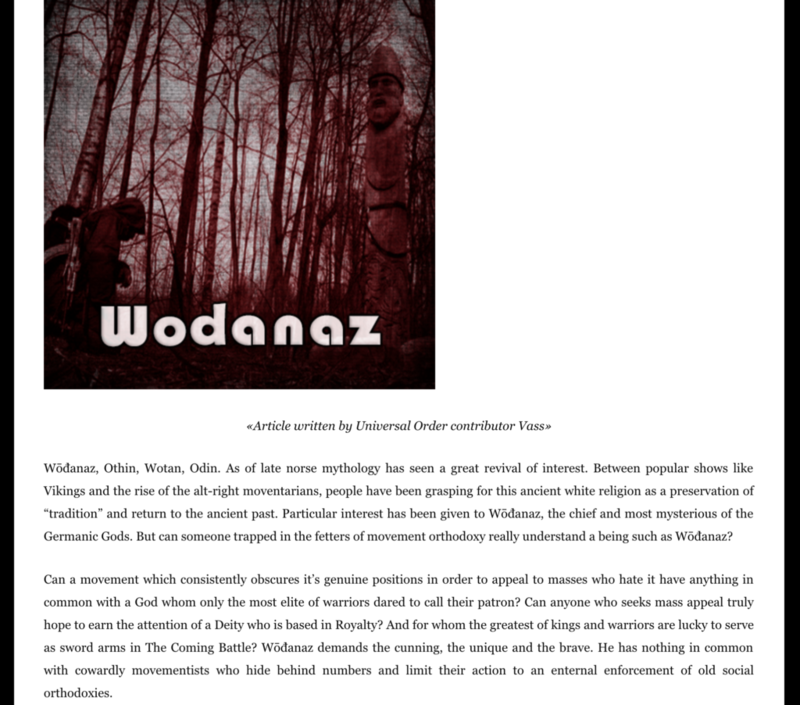 Wōđanaz is not the God of the stay at home, He is the God of the wanderer. Wōđanaz is not the God of the lemming masses, He is the God of the Aristocratic elite. Wōđanaz is not the God of the movementarian who waves a sign, hoping to attract an army before he even thinks about serious action. He is the archetypal God of those who Embrace Universal Order. Who prepare for the end and take action to effect themselves and their own reality. Wōđanaz serves as an archetype for the initiate of Universal Order to follow in the quest for Truth,” Carver writes. His reference to “Universal Order” is to a phrase coined by mass murderer Charles Manson of a worldview of a new global order of Aryan control that can only happen after an apocalyptic collapse of current global institutions. After completing 13 weeks of U.S. army basic training in the summer of 2017, Carver was sent to Fort Sam Houston in Texas for advanced training as a combat medic. After completing the training in Houston, he was then sent to the Ist Armored Division, 27th Forward Artillery Battalion, Headquarters Battery at Ft Bliss near El Paso, Texas. Since, he has been deployed at least once to Camp Buehring in Northern Kuwait. While in Houston, he joined the Texas cell of the Atomwaffen Division. 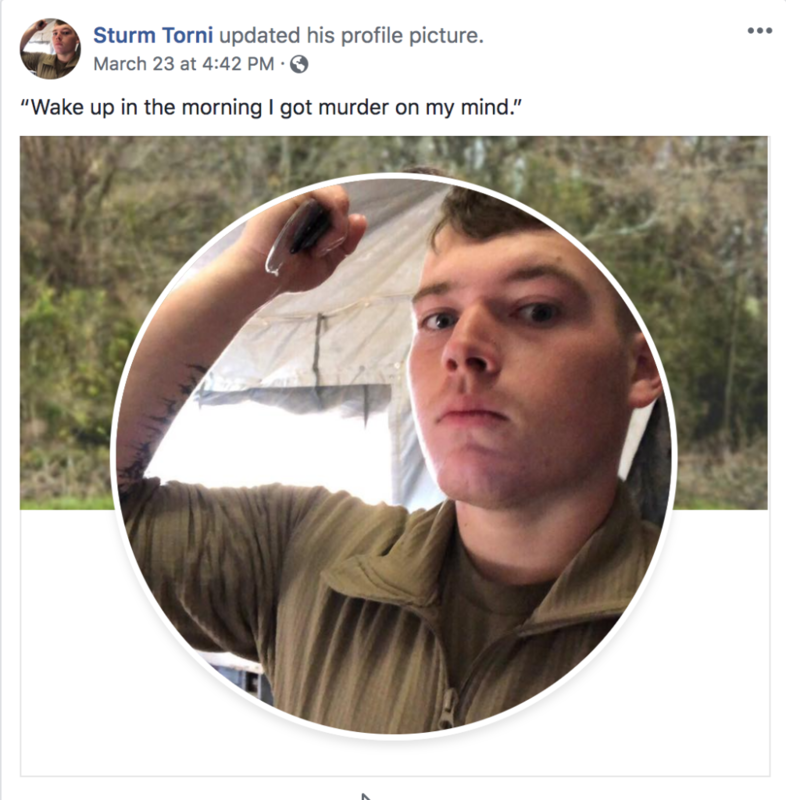 Since enlisting in the army on April 11, 2017 in his Virginia hometown, Carver has covertly participated in Atomwaffen Division armed military training “Hate Camps” in the southwestern U.S. and other activities on behalf of the U.S. domestic terror group. 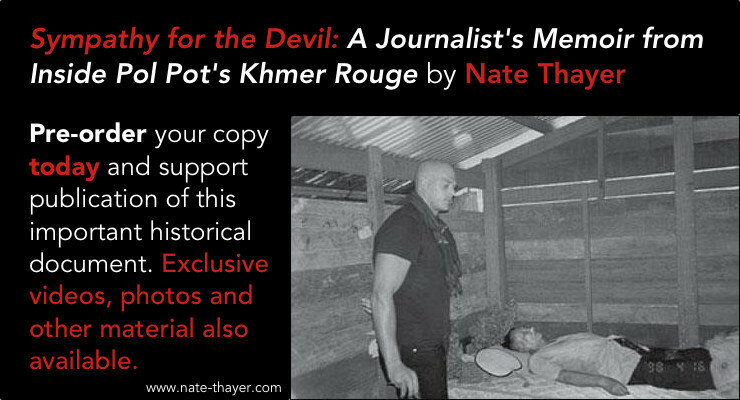 While an active duty soldier, Carver has made numerous online references to his activities with the doomsday cult terror group, including posting photographs from U.S. military facilities that reference his clandestine political activities. Carver was promoted to Private First Class in a ceremony at Ft Bliss in February 2018. 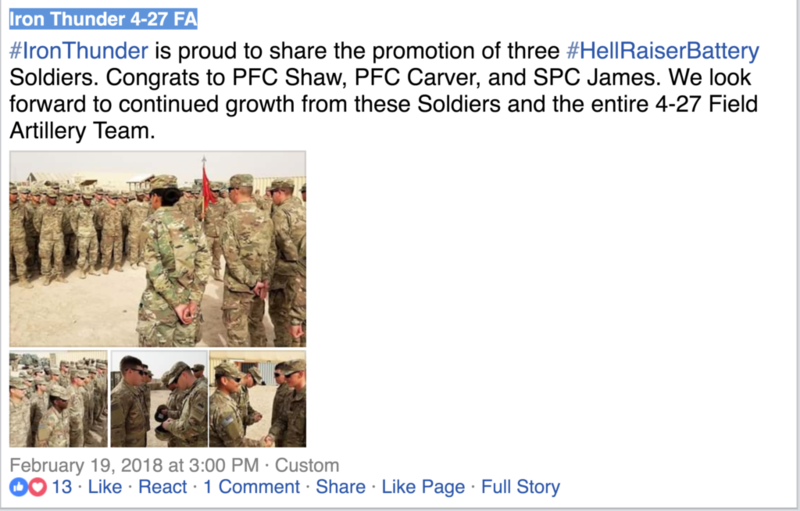 “#IronThunder is proud to share the promotion of three #HellRaiserBattery Soldiers. Congrats to PFC Shaw, PFC Carver, and SPC James. We look forward to continued growth from these Soldiers and the entire 4-27 Field Artillery Team!,” reads a posting on the 1st army division Iron Thunder Facebook page. In online chat logs from servers where Atomwaffen members congregate, Carver discussed the need to keep his Atomwaffen Division membership secret from his superiors knowing it was forbidden by army rules. Carver said in a December 12, 2017 conversation with head of the Atomwaffen Division Washington state cell, Kaleb J. Cole. The two were discussing another member having broached the group’s operational security methods to protect their identities. “Just don’t be open about it,” Cole advised Carver. 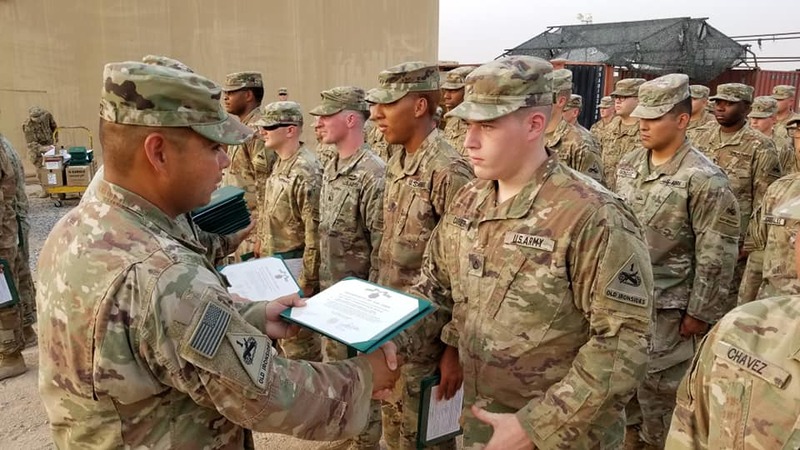 Carver was deployed in late 2017 to U.S. army base Camp Buehring in Northern Kuwait. From there and from Ft. Bliss, he posted numerous references to his Nazi, Satanic, and white supremacist activities on social media. Carver, like all Atomwaffen Division members, used numerous aliases on social media and the group operated their own by invitation only secure server on the online gaming platform, Discord, where they would congregate for group discussions. Carver’s Instagram screen name is killing.j0ke https://www.instagram.com/killing.j0ke and his biography reads “I am the leper that leers at the gate.” The name is listed as “Storm Carver” and the thumbnail is a picture of Carver. 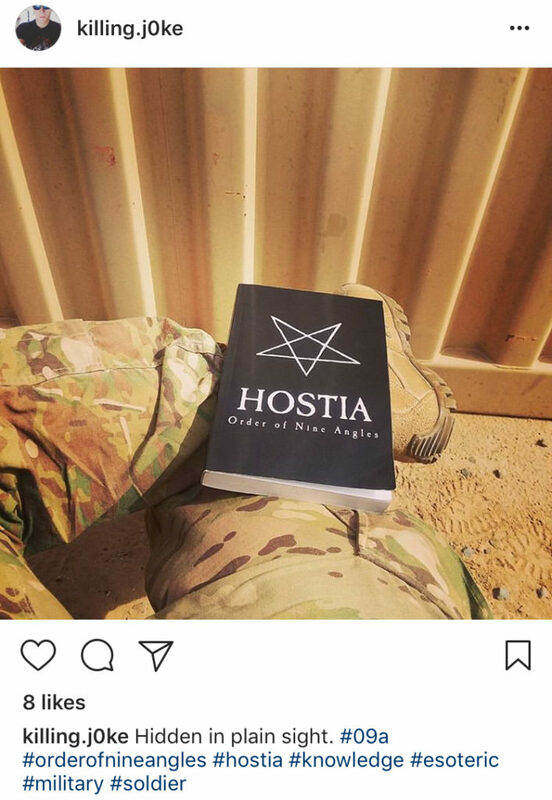 “As soldiers of the Sinister way, we are the holy warrior Jihadists in the name of Satan,” reads a passage from Sinister Tradition. 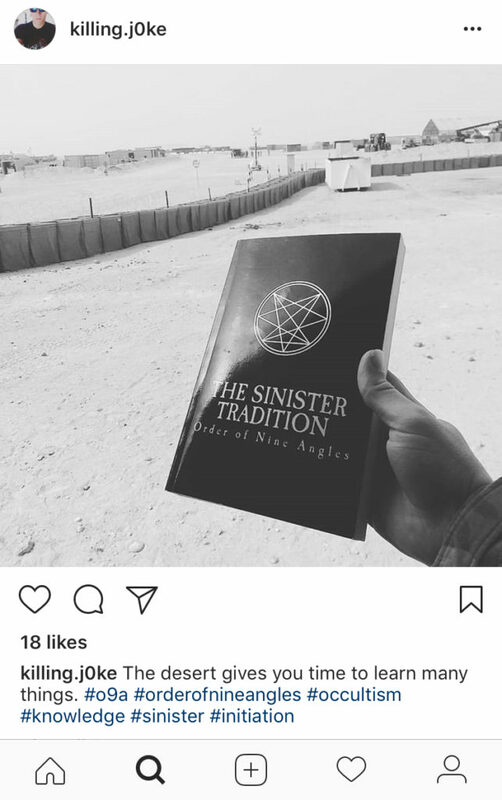 The inclusion of the hashtags “#sinister” and “#initiation” suggests that Carver’s enlistment in the military may be part of an O9A Satanic initiation passage. Both the books Hostia and Sinister Tradition are manuals for O9A Satanic initiates which detail options to fulfill requirements for adherents. 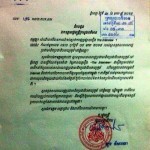 One specifically details enlisting in the military. It is unclear whether Carver enlisted in the military for the purpose of advancing the work of the Atomwaffen Division, but members are encouraged to join the military to obtain weapons and tactical skills they can use to train other group members. Military service “was a benefit to the group because they got training that they could offer to others,” said one former member of Atomwaffen Division in an interview. Other photographs include Carver, wearing a U.S. army shirt, taking a selfie of himself giving the Nazi salute in the bathroom mirror of his quarters at Ft Bliss. Carver invokes anti-Semitic, racist, and homophobic references in many of his social media comments. Carver has repeatedly detailed his allegiance to the armed overthrow of the U.S. government through the use of mass violence and domestic terrorism. The Atomwaffen Division are responsible for at least 5 murders in since May 2017 and aggressively promote the use of mass violence and the targeting of ethnic groups, religious groups, and political opponents. They openly celebrate terrorist attacks against churches, mosques, synagogues, gays, non-whites, Jews and others. They applaud and celebrate terrorist attacks on churches, mosques, and synagogues and view as heroes of their cause such people as Robert Bowers, who shot and killed 11 worshippers at Pittsburgh Tree of Life synagogue last October; Dylan Roof, the 21-year old American white supremacist who murdered nine elderly African American church parishioners at the Charleston, South Carolina Emanuel African Methodist Episcopal Church on June 17, 2015. Following articles will profile other newly uncovered members of the Atomwaffen Division. Other following articles will detail the twisted history of the Satanic cult Tempel of Blood, its leaders Joshua Sutter and Jillian Hoy, and their years long mission infiltrating, disrupting, and turning vulnerable extremist organizations into vehicles to carry out acts of violent terror. This investigative journalism has not been funded by any media or other organization. I am a freelance investigative journalist. The ability to conduct this kind of journalism requires considerable resources and time and is only possible through the financial support of readers. If you find this or my other journalism important and worthy of your support, there is a PayPal button on the top right of this page. All donations are appreciated.